Hubby got home Monday night just in time to clean up after our sick kid, but he loved the shower ideas and even tore out the last few studs in the shower so he could feel like part of the process. Oh and he also drove around the neighborhood like a nut last night sticking bits of demo trash into our friends half-full garbage cans. So he’s done his part. Me: Sounds good, let’s do all that. But what about the shower? Him: The shower? Is that a priority? I thought that was down the road. I didn’t think you were going to get to that for a while. Me: I tore out the walls yesterday. I’ll send you some pictures. Him: Ok I can do it on Wednesday, will you be ready? Me: Of course, yeah no problem. Him: You know you have to pick out your shower fixtures before then? And have the valve ready for me to install. Me: Huh… I guess I’ll look into that. So showers… I cannot for the life of me understand why in this day and age there is no such thing as a universal shower valve!!! Righting this wrong might be one of my new life missions. The whole reason our shower was inoperable was because that a cartridge in the valve died. Nobody is making that valve anymore so the cartridge is a special order part. Our shower fixtures were hideous and I couldn’t see getting a special order part just to fix the ugly system we had. And that valve couldn’t be replaced without removing tile to get behind the wall. Such a jacked up system! Maybe a universal valve wouldn’t solve the problem of a broken valve, but it would be easier to get parts AND it would be a lot easier to choose shower fixtures. I really think it should be a homeowner’s prerogative to change their plumbing fixtures at any given time, but you can’t. You’re lucky if you can swap them out for a different style made by the same manufacturer, but even then there is no guarantee. 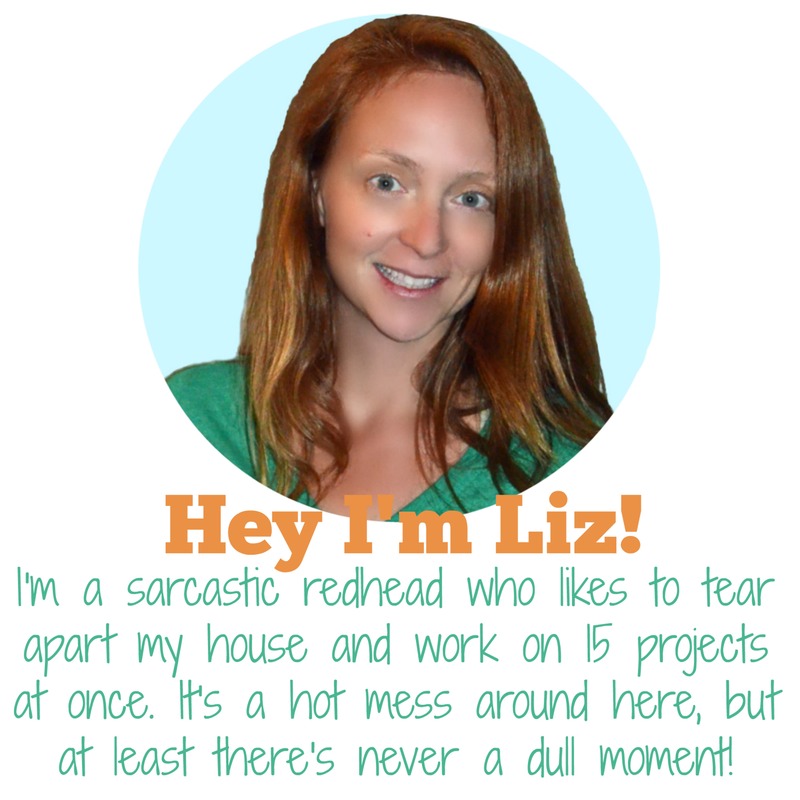 And who the heck wants to live with this? I waited until Wed morning to go out a buy said valve. Mainly because I’m me, but also because I was stuck at home with little miss puker all day Tuesday. First I went to my local Ferguson Showroom. I’d never been in there before. And I’ll probably never go back. I had to beg someone to help me and after 20 futile minutes they could not offer me a single valve of any brand or variety anywhere in the state of NJ that day. Moving on. Back in my car I googled ‘plumbing fixtures’ and found a place called Kitchen & Bath Works right across the highway. (I’m usually a Home Depot or Lowe’s kinda gal, or I buy online, so this plumbing fixture store thing was all new to me.) My new BFF Rich who worked there had me narrow down a brand I liked and said I could choose my fittings later as long as I stayed with that brand. 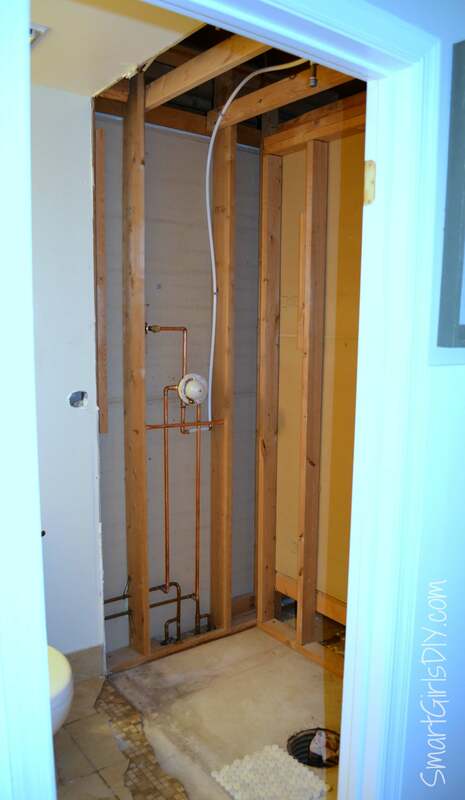 Just worry about getting the valves that go behind the wall right now, then decide on the rest later. He had me out the door with a Kohler pressure valve and transfer valve in under 15 minutes. but even though it was Kohler it didn’t use the valves I purchased earlier that day. Ughhh!!! The valves I bought were for a separate valve trim and diverter. something like this. The diverter is the top square and the valve trim (on/off, hot/cold) is the bottom square. 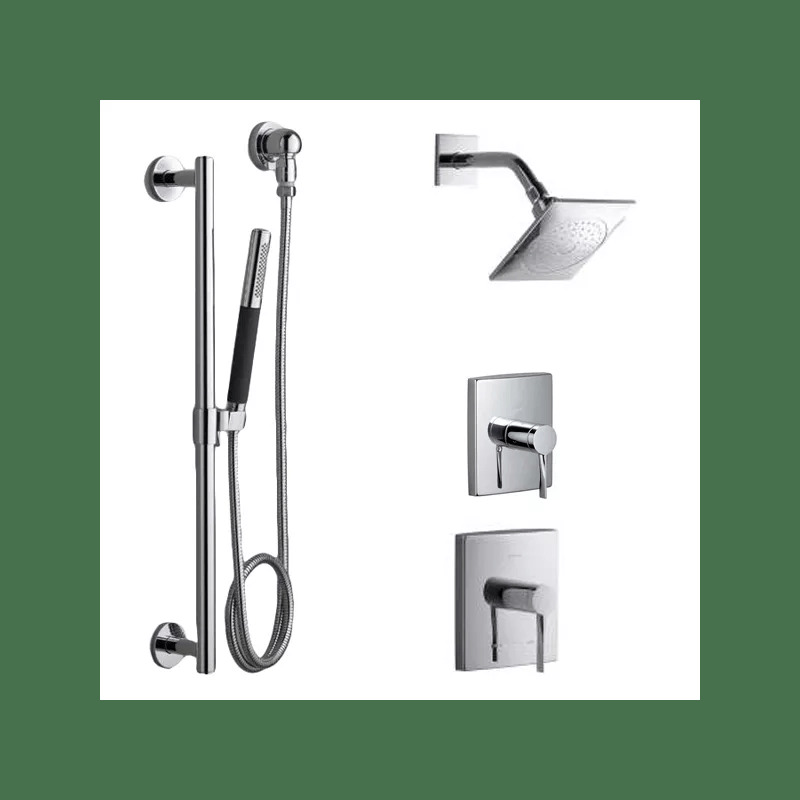 The diverter is what switches between shower head and hand shower. With this two-piece option the diverter can be switched to combo mode too (shower head + hand shower), so there are really 3 choices. This is just a guest bathroom, which has seen fewer than 50 showers in the 6 years we’ve lived here, so I didn’t want to go overboard. I was given the rain shower head which seems like an awesome luxury and I figured the hand shower was a worthy investment for rinsing off and cleaning the shower itself. But I could skip a step by getting a one piece valve with push button diverter. It’s the same concept as a bathtub — where you pull up to switch from bath faucet to shower head — only here you’ll get the hand shower when you press the diverter button. It saves me money and tiling work having only one fixture and one combo valve, rather than 2 of each. I started to make a little cheat sheet for parts of a shower system, but didn’t like how it was turning out. I decided an infographic would be awesome, but I’ve never made one. I went to my go-to source to learn no computer/graphics skills — Lynda.com — and found this course for teachers called Creating Infographics. I love Lynda.com, but I can get overwhelmed with all there is to learn. I’m like a kid in a candy store! This video is only 7 minutes long, so I should be an infographics wiz by tomorrow. 🙂 You will be the first to know because my first infographic will be Parts of a Shower System. I live such an exciting life, I know. Moved the copper pipes back a foot into the “real” wall. 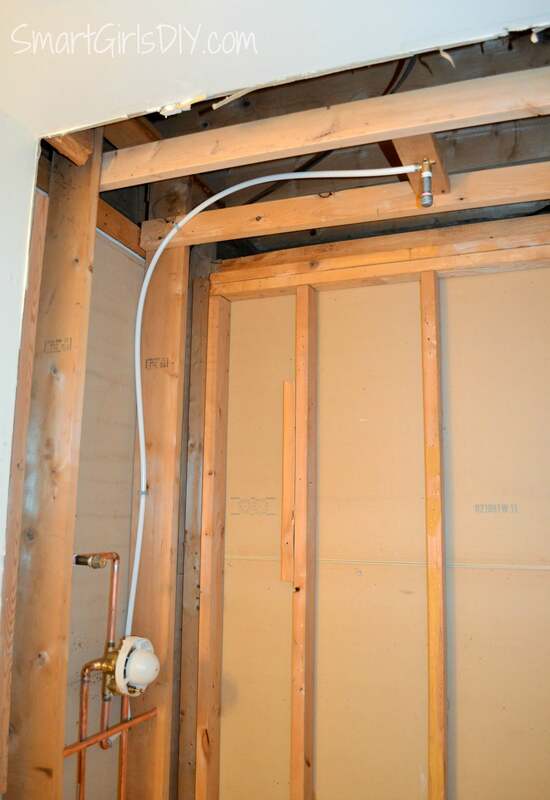 The pipes already came up from the concrete slab in this wall, but for whatever reason the builder made the shower a foot smaller than it needed to be, which involved adding two 90° turns and the building of an unnecessary bumped-out wall. 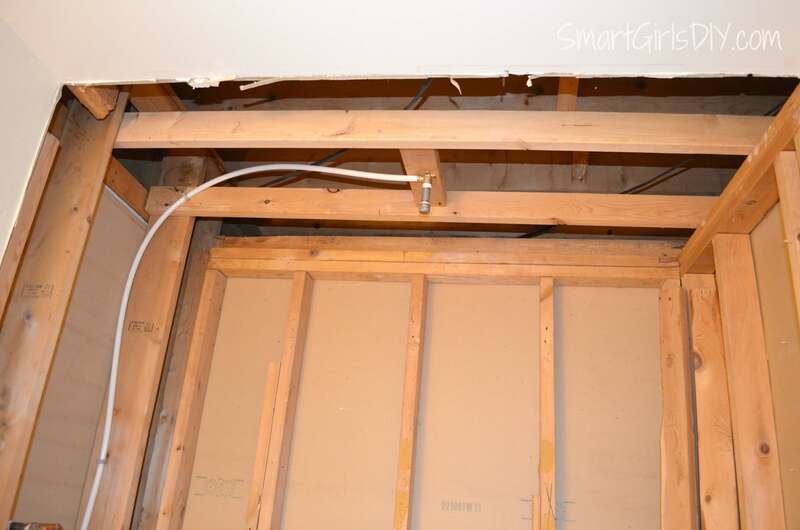 Ran a line into the ceiling which will attach to the rain shower head my friend Cindy gave me. At first I was going to go 24″ from the fixture wall, but I changed my mind and we went with centered, which is 30″ for our 60″ shower. But I might move it another 6″ which would be directly over the drain, which is 6″ off-center because it was centered on the original 5′ shower pan. There’s a lot I haven’t decided on there. Ran a secondary line for the handheld shower. I didn’t order one yet, but I had to make a decision on where the hose would exit the wall, which was not easy. I consulted Pinterest for five minutes and decided to go with this setup… Hose starting to the top left of the valve trim, then looping under valve trim and up to wall-mounted bar. I must have really liked this setup because I just got back from another trip to Kitchen & Bath Works and I ordered a hand shower that looks exactly like this. The hook on the wall seems like a good idea too. I like how detailed you are with how this process went for you. I see a lot of blogs where people just casually gloss over the important in-between steps. And it’s all the in-between stuff I really need to know, like the part about diverters and valves! I’m clueless when it comes to that stuff. But I’ve got to figure it out if I ever want to DIY anything in our house. Wow, the before and after difference is AMAZING. 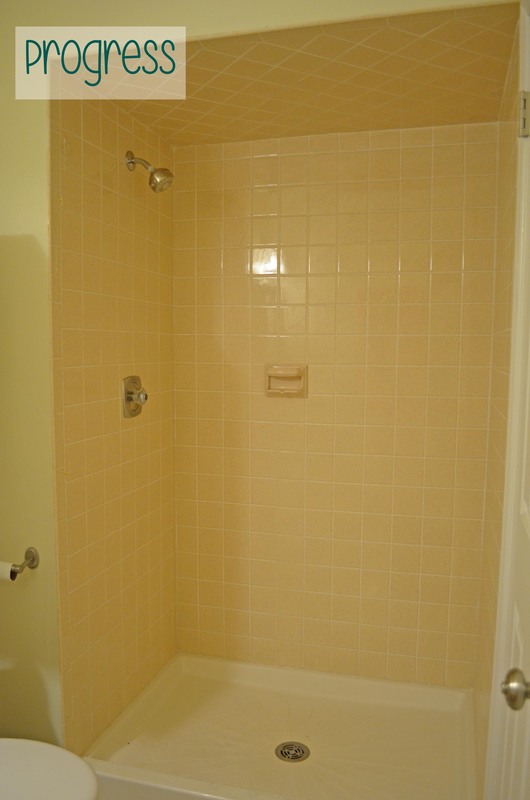 I love that the tile is vertical. I’ve got tiles kind of like that, horizontally, and I’m really wishing I would have seen this before we installed them last week. I love how this looks, so much more! Great job. Don’t forget to install some good fixtures for your bathroom design renovation. Thanks! We are planning to add a bathroom in the basement so I will have to keep all of this in mind. Wow! This was really impressive. I love the shower head you ended up going with. The combination shower head and hose is the way to go. Thanks for sharing.